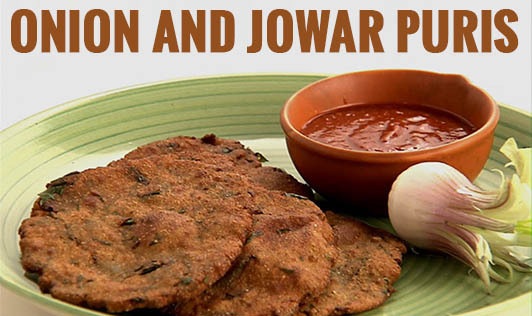 Make these healthy puris with onions and sesame seeds. This low fat recipe is apt for both young and old in the family. Since its baked and not deep fried, one can have it guilt free too! Make the puris in advance and keep them ready for those sudden hunger pangs. 1. Combine all the ingredients and knead into firm dough using enough water. 2. Divide the dough into 30 equal portions. 3. Grease your palms with oil; roll each portion of the dough in between your palms into a 38 mm. 1½" diameter circle, using very little jowar flour for rolling. 4. Grease a baking tray using the remaining ¼ tsp of oil, place the puris evenly over it and prick all over the puris using a fork. 5. Bake in a pre-heated oven at 180°c for 20 minutes or till the puris are golden brown and crisp, turning them around once after 10 minutes. 6. Repeat steps 4 and 5 to make one more batch of 15 puris. 7. Cool and store in an air-tight container. These will stay fresh for 3 to 4 days.